Batman: The Dark Knight #10 pgs. 2&3 - Batman Imposters 2012 art by David Finch. Size: Two 8" x 11 3/4" pages, taped to the back, to make one 15.5" x 11 3/4" DPS. This item was uploaded by Bobby. If you have any specific questions or requests, please ask us prior to ordering and we'll get back to you as soon as we can. I've had some bad experiences.. You needn't worry; we are professionals who value your business and want your item to arrive safely as much as you do. I have been collecting for over 30 years. I send out items the way I would like to receive them. This is normal for our Post Office and will not impact you receiving your item in a timely matter. Have these CGCs had any previous owners? Pictured left to right, my employees: Chris, Connelly, Bobby, & Shannon alongside my family: Sharon, Myself (Anthony), Cameron, AJ, and Jamison Snyder. 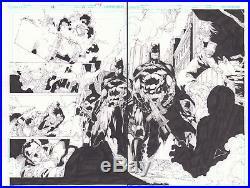 The item "Batman The Dark Knight #10 pgs. 2&3 Batman Imposters 2012 art by David Finch" is in sale since Thursday, September 6, 2018. This item is in the category "Collectibles\Comics\Original Comic Art\Splash Pages".